"The Wheels on the TCAT Bus"
Featuring the special debut of "The Wheels on the TCAT Bus" Song! ‍FREE ADMISSION -- Show your library card or an event flyer to TAKE TCAT FREE! 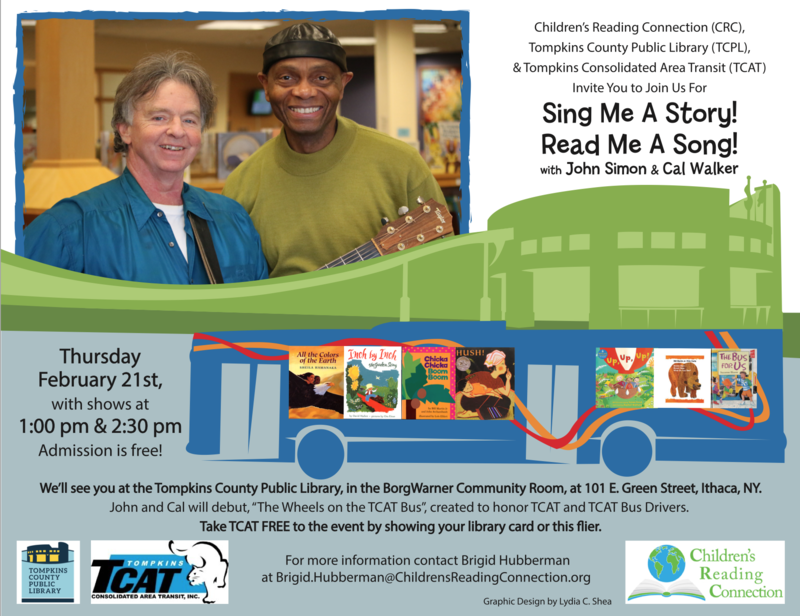 Children's Reading Connection (CRC), Tompkins County Public Library (TCPL), and Tompkins Consolidated Area Transport (TCAT) are happy to present together Sing Me a Story! Read Me a Song! with John Simon and Cal Walker, a gift for children, families, and everyone in the community during school winter break. Join us on Thursday, February 21st for shows at 1:00 and 2:30 pm, at the TCPL in the BorgWarner Community Room, 101 E. Green St, Ithaca, NY. Admission is free. Our community’s reading and singing heroes will perform a wonderful new line-up of children’s books featuring story songs, including "Brown Bear", "Chicka Boom Boom" and "Hush" music written by John Simon, and the morning song "Incredible Day" by Cal Walker. The Debut of New “The Wheels on the TCAT Bus" Song! Don't miss the debut of “The Wheels on the TCAT Bus,” John and Cal's new song created especially to honor TCAT and TCAT bus drivers who serve our community by helping children and families in Tompkins County get "all through the town" every day, in all kinds of weather. “Take the TCAT” for FREE! Children and families are invited to ride a TCAT bus to the show and back again for free. Just show your library card or a “Sing Me a Story” flyer as your ticket! CRC is pleased to support John Simon and Cal Walker in continuing to share their reading and singing talents with children and families in Tompkins County and beyond through the new Sing Me a Story! Read Me a Song! with John Simon and Cal Walker. Brigid Hubberman, John Simon and Cal Walker, with support from area speech-language pathologists, ICSD pre-k teachers, Jon Hilon/Hiltronix, and an anonymous donor, created Read-Along Songs in 2008 as a program of the Family Reading Partnership, where it continued until 2016. Free Sing Me a Story! Read Me a Story! with John Simon and Cal Walker performances will continue each month this year across Tompkins County, with a commitment that all pre-school children will have the shared experience of these beautiful story songs with John Simon and Cal Walker, as cultural capital enriching the path to loving and learning to read. Funding is also being sought to provide the set of six books and audio recordings to all pre-kindergarten and Head Start children and their families in Tompkins County. CRC looks forward to sharing this model initiative with other communities in New York State and beyond. Children’s Reading Connection is a new national literacy organization based in Ithaca, NY. CRC is helping communities to ensure all babies and children are surrounded by wonderful words, beautiful books, and the joy of reading as cornerstones of family and community life. In addition to serving as a community-literacy catalyst, connector, and convener, CRC is developing community-literacy program models to share far and wide.